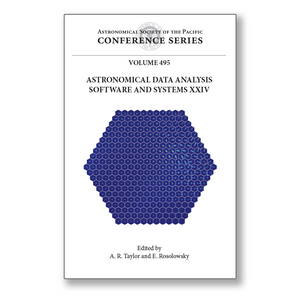 Editor(s): Taylor, A. R.; Rosolowsky, E.
This volume of the ASP Conference Series contains the proceedings of the twenty-fourth conference on Astronomical Data Analysis Software and Systems. This annual conference, held in a different location each year, is a forum for scientists, systems developers, and programmers working in areas related to algorithms, software, and systems for the acquisition, reduction, analysis, and dissemination of astronomical data. Development of software and systems for processing and analyzing astronomical data is a rapidly evolving field. Advances in detector technologies and data acquisition systems at astronomical observatories over the past decades has created massive and ever growing archives of astronomical data, creating challenges in data curation, data management, and access to both historical and current data. At the same time, new large-scale sky surveys from gamma-ray to radio-wave radiation require intelligent pipeline processing systems to turn raw data into useable information in a timely fashion. Major facilities on the horizon, such as the Large Synoptic Survey Telescope and the Square Kilometre Array, will create data at unprecedented rates, driving a need for scalable solutions to processing, analysis, and visualisation challenges for astronomical Big Data. To share ideas and directions on the latest developments, ADASS XXIV contributors addressed the following themes: Big Data challenges, large surveys, Web services and APIs, how we code today for data analysis and pipelines, meta-data management, visualisation for astronomy, and file formats for astronomical data. This volume contains 128 papers representing the invited, contributed, and poster papers presented at the conference, as well as "Birds of a Feather" sessions and demonstrations of new software systems.